I haven’t made a news post for a very long time and while I’m still lacking some stuff that I’d like to share with you, I’ve eventually decided to break the silence. It is better to show less than show nothing – I’m sure we can agree on that! I’m absolutely here, working on the game in full-time, I haven’t started any new projects in the meantime. I really wanted to show you a complete tech three in this announcement, but unfortunately, I failed to deliver it so far. 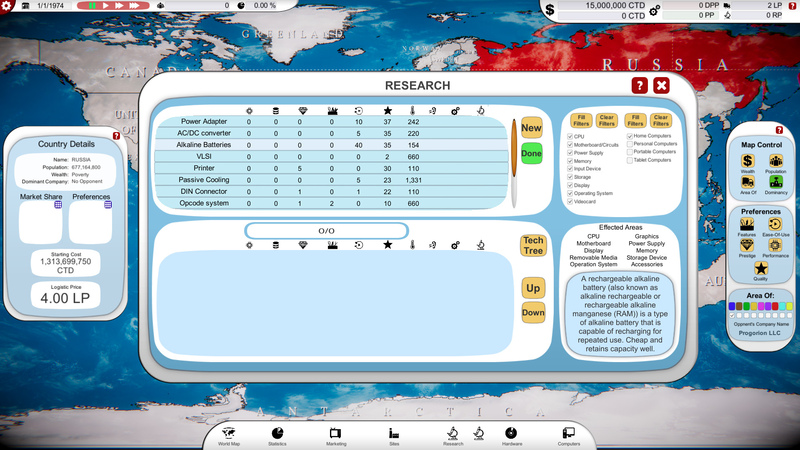 I had some bad directions with it, also it has been expanded as the new features require it on the roadmap. I will talk about it and show the current state in this article – also I will talk about my progress and the lack of progress, new dilemmas and the nice stuff. Announcement: The Roadmap of Computer Tycoon for 2018 is HERE! Next to the fact that I’m working on really ambitious plans and the tasks I’m working on are not splittable and they cannot be published partially, the second reason why I’m not publishing new stuff is the Employee or Manager system that the game will get. It is something that won’t be in the game for months yet, but it included some new technical challenges which had to be prototyped out and also I had to support my outsourced friend in the graphic/animation creation process, I had to test out everything so that later I will be able to use his work alone when it will be he who won’t be able to support me (time management in a single dev company lol). He makes nice 2D art but he has no experience in animation and game dev. (Remember, basically I’m alone developing the game and while I’m creating most of the visuals/graphics I needed more help this time – but this creates management tasks as well). The third reason is that life made it hard for me to keep my deadlines in the last months. First, my landlord asked us to leave the flat where we live and it was hard to find a new rent, while it was also a great financial load on me. And after the move when I felt I can really dig into the work I got sick. I had several tests (and others are still going on) because of the severe pains I have lately, but doctors still couldn’t find out what my problem is. Luckily it seems I don’t have liver and heart abnormalities (which were the first danger factors) and now it seems that either I have some kind of infection and/or neurological issues. I won’t abandon the game! I just can’t work as much as I’d like to and as I used to. Often full days are off because of that. Possibly one of the reasons I’m ill is that I overwhelmed myself last year. But whenever I feel okay, I’m working – and I’m still in love with it. Don’t worry, I will carry this out. And actually, I put together some nice stuff! I know that some of you are really not interested in all of that, but I really felt I should talk about them. Your support means a lot to me! Also, if you miss updates, follow me on twitter (@Progorion) there you will know everything about me and Computer Tycoon in the meantime! So what’s new around the game? As you remember, when the Manager System (let’s call it like that from now on, because those guys will be managers, not simply “employees”) will be added to the game you will start in this garage. After you made your first computer model, and you sold some copies, you will get into your first real office. And look! Now the character animations are done, my assets are ready to go. From here you will work up into bigger and better offices! Last time I posted the picture of the mini computers, now we added the tablets as well. Why not? It is totally fine to use tablets on a desktop nowadays. So as you can see, the Manager System has its assets ready (excluding the faces I’m making paralelly) and the challanges are tested, now I won’t have to focus on it for long, so I will fully go back to the tech tree and other features which will be in the very next update. you also can see a column for the new heat/cooling parameter. And here is the tech tree. Remember it is not finished. Even earlier base lines/connections are not finished as you can see, but we will have some longer, wider links as well. an extra cost for jumping too far from the current tech era – simulating the normal progress of technological development. is a bit more real design system. Yet another thing that I will have to care about is the option to buy blueprints from others. I think there will be 4 possible states for techs in your tech tree. You just don’t have it. You bought a specification of a competitor – so you will be able to go forward in the tech tree to other things which need this given bought specification, but still you won’t be able to use it in your own products. You bought a blueprint/license, so you can actually use it as it was your invention. I’m trying to figure out a lot of things because all of the other screens are connected to these systems. And well, it is complicated. What else I have? Well, next to the manager system, new techs and other features, I’ve made a new company logo, got new songs for the game, but I even made a new loading screen. How do you feel about it? The texts are not finished, but I really wanted to make it happen. 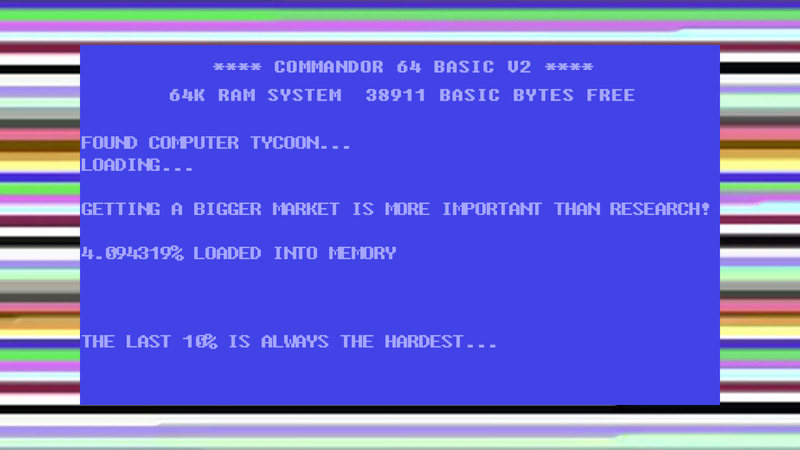 Those of you who used Commodore computers must remember to this or to a similar loading screen. 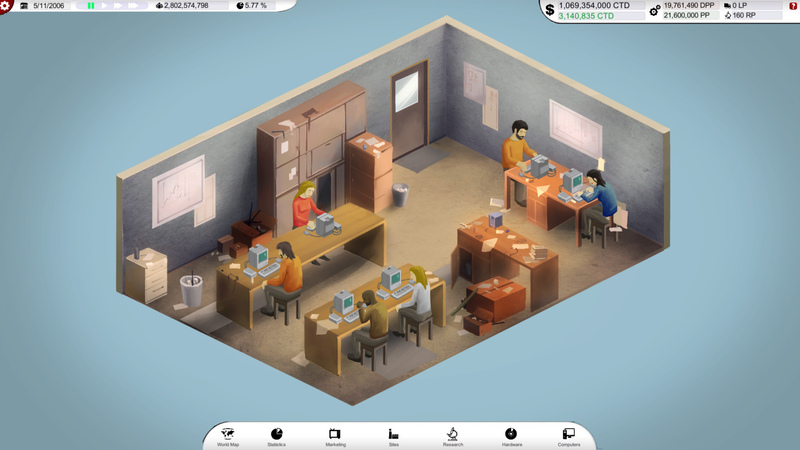 If there is a game where an Easter egg like this is appropriate then it is Computer Tycoon. So when will we get a new update? As you probably know every summer we have sales on Steam. I’d love to publish a new version before or at least during it, but I’m afraid it won’t be possible due to my health issues and simply the amount of remaining work. But I really hope that on the next anniversary of Steve Jobs ( on October 5th) you will have most of the features of the game. That will be also the end of the first year of the game on Steam – so I’d like to make it big. Until that, please continue sending your ideas and feedback about the current build on Steam. I got some really nice ideas in the forums (I read all of them, I’m sorry if I didn’t reply to any of yours – but be sure I saw it!) And please leave a review if you like the game! WE NEED *put here your language* LOCALIZATIONS! Huh, I know, I know! Please understand that I have plenty of things to do and localizations will be possible to include only when the single English version is finished. As I promised earlier the game will have plenty of translations (professional ones and some community based) including:Chinese, German, Russian, Portuguese, Turkish, Spanish, French, Italian, Hungarian and maybe a couple more.